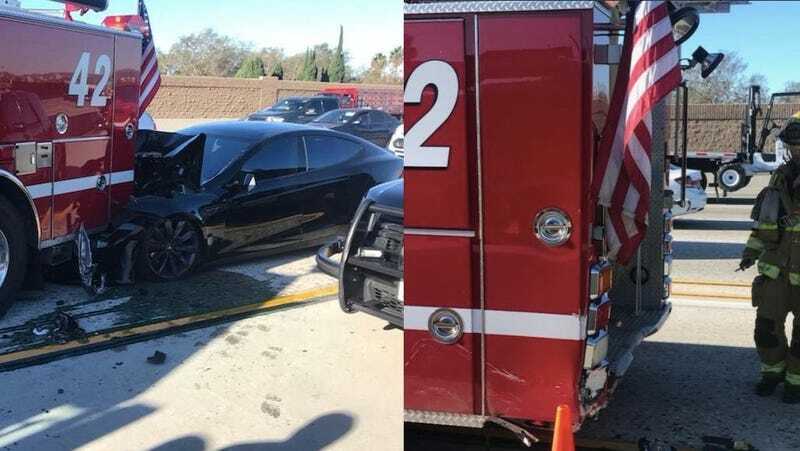 A Tesla Model S driver smashed into the back of a parked firetruck Monday morning, according to California fire officials, and claims the car was in its semi-autonomous Autopilot mode when it happened. The car hit a truck around 8:30 a.m. Monday on Interstate 405 in Culver City, according to the union representing firefighters in the city. The California Highway Patrol and Culver City Fire Department told the San Jose Mercury News that a Tesla hit a fire truck, but neither could say whether the vehicle had been on Autopilot. The fire truck was situated in the left emergency lane, blocking the scene of a previous accident, the newspaper reported, when the Tesla-involved crash occurred. When reached Tuesday morning by Jalopnik, a Tesla spokesperson reiterated the company’s official line on Autopilot. “Autopilot is intended for use only with a fully attentive driver,” a Tesla spokesperson said. Autopilot is a suite of advanced driving assistance features, including adaptive cruise control and Autosteer, which keeps the car driving within a lane. It’s unclear if the car slowed down before the crash. “It was a pretty big hit,” Powell said. The Tesla driver refused medical attention, the newspaper reported. Tesla’s automated driving features have been in the news time and again since mid-2016, after a Florida driver was killed after getting in an accident while his car was traveling in Autopilot. In part, the National Transportation Safety Board blamed the driver for relying too much on Autopilot, as well as Tesla for allowing the feature to be used on roads that may not be suitable for automated driving. We say it often, but again: if you do in fact use driver aids like this, please, please, pay attention to the road. The U.S. National Transportation Safety Board is gathering information about an accident involving a Tesla Inc. Model S sedan that rear-ended a firetruck on a freeway near Los Angeles on Monday, the agency said. The safety agency has not yet decided whether it will open a formal investigation of the crash, NTSB spokesman Chris O’Neil said in an email.